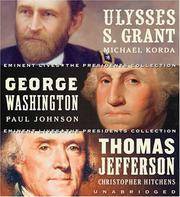 Eminent Lives: The Presidents Collection CD Set: George Washington, Thomas Jefferson and Ulysses S. Grant (Unabridged). By Atlas, James; Read by Sam Tsoutsouvas. HarperAudio, 2006. Audio CD NEW NEW, still in shrink-wrap box -- 13 Hours (unabridged) on 11 CD's. "George Washington: The Founding Father" written by historian Paul Johnson. "Thomas Jefferson: Author of America" written by Christopher Hitchens. "Ulysses S. Grant: the Unlikely Hero" written by Michael Korda. 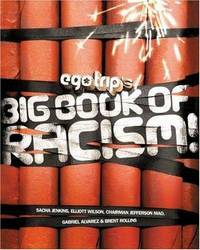 ego trip's Big Book of Racism! By Jenkins, Sacha; Elliott Wilson, Chairman Jefferson Mao, Gabriel Alvarez, Brent Rollins. A Thrilling and Truthful History of The Pony Express or Blazing the Westward Way and other sketches and Incidents of Those Stirring Times. Olympic Valley, CA: Outbooks, 1977. First Edition Thus Glossy Pictorial Wraps AS NEW in WRAPS 8vo (6 x 9), 54 pp including maps, B&W illustrations. This paperbound book is FINE, AS NEW with a slight bend on the upper left corner of the back cover of the green glossy wraps, otherwise also AS NEW. (h) Excerpted from the original 1908 book, with illustrations from that book and other sources, and a newly drawn map in the center showing the route with each station marked. 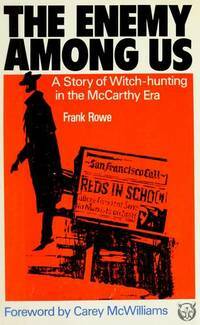 Enemy Among Us: A Story of Witch-Hunting in the McCarthy Era. By Rowe, Frank; Foreward by Carey McWilliams. 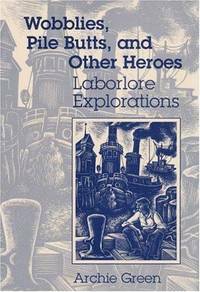 Wobblies, Pile Butts, and Other Heroes: LABORLORE EXPLORATIONS (SIGNED). Chicago: University of Illinois Press, 1993. First Edition Glossy Pictorial Wraps NEAR FINE in FINE DJ 8vo (6-1/4 x 8-1/4), 523 pp including extensive Index, 44 pages of references, and list of Illustrations. BInding is dark blue cloth in FINE glossy pictorial DJ with woodcut of waterfront worker sitting on a pier. Book is inscribed and signed by the author, and is FINE except for a pale pink stain on the page-edge bottoms. Archie Green was (and is) a folklorist who spent more than 70 years searching out and recording work songs and writing about labor. At this writing, at age 90, he is teaching at the University of California in Berkeley. This book is one of the excellent Folklore and Society series published by the University of Illinois Press. The Plainsmen of Yellowstone: A History of the Yellowstone Basin. Through the Country of the Comanche Indians In the Fall of the Year 1845: The Journal of a U.S. Army Expedition Led by Lieutenant James W.Abert of the Topographical Engineers. By Abert, Lieutenant James W.; John Galvin, Editor. San Francisco: John Howell Books, 1970. First Printing - Limited Edition Cloth AS NEW in VG DJ Folio (10-1/2 x 14), 78 pp w/ Index, Glossary, and References; 2 B&W foldout maps (Mexico & California with Abert's Routes superimposed in red; New Mexico and the Southern Rocky Mountains showing the Route pursued by the Exploring Expedition.) 26 watercolors of Comanche groups and individuals painted by Lt. Abert during the expedition. The paintings have a primitive charm, and are almost childlike. The book itself is apparently AS NEW, without a mark, all pages tight and clear. The cover is cream-colored cloth with gold type. The DJ is cream-colored with black and red type, and has some slight chipping along the bottom edge as well as some individual marks. With those exceptions noted, the DJ would be VG. It is now protected in mylar to prevent any further damage. Written 160+ years ago, published 35+ years ago in a limited edition of 5000, beautifully printed on fine deckle-edge paper. An unique record of little-known Americana and would be prized anyone with an interest in the history of the Southwest flora and fauna, and the early friendly interactions between the Euro-settlers and the Comanche. London: Bloomsbury Books, 2002. First Edition Cloth As New in As New DJ in mylar protective cover. 8vo (6 x 9.5), 280 pp including Appendices: The Crew of the Globe; Transcript of George Comstock's Narrative; Lay and Hussey's Marshallese Vocabulary; The Comstock Family (American Genealogy); "The Young Mutineer," poem by Henry Glover (1824); and Bibliography and Notes. The book includes maps and illustrations. Book is maroon cloth with gold type on the spine in a pictorial dustjacket showing two whaling ships. Both are AS NEW, in mylar cover. Ships from California, USA. In 1824, 2 years out of Nantucket, 21-year-old Samuel Comstock led a mutiny on the whaling ship, "The Globe." The captain and officers were attacked and killed, and Comstock's dream of his own tropical kingdom lasted less than a week before the islanders of the Mili Atoll in the Marshall Islands killed and enslaved them. Some of the mutineers slipped aboard the ship and escaped, including Comstock's younger brother, George, who wrote his own account, included in this book. An amazing and ghastly story.